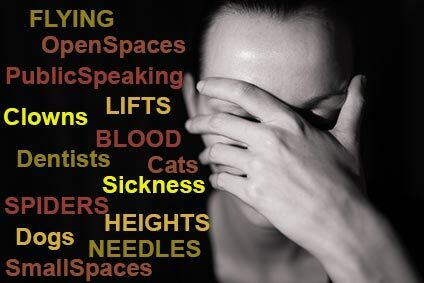 Do you suffer from fear of spiders, flying, small spaces, heights, needles or any other phobia? Hypnotherapy has been proven to be the extremely effective in helping people to overcome phobias. Using hypnosis I will increase you confidence and ability to stay calm when confronted with your phobia. Phobias like anxiety and mild depression are usually the result of repressed emotions. Emotions that have been repressed give rise to the symptoms in the form of phobias, anxiety, and panic attacks, feeling low and having a low self esteem. Using hypnosis I will help you to reprogramme your thoughts and clear the irrational fear so you can stay calm when confronted by your phobia. Phobias are extremely common. Sometimes they start in childhood for no apparent reason, sometimes they can emerge after a traumatic event or sometimes they can be linked to anxiety. People are not born with phobias, phobias are just some bad programming, causing the unconscious mind to protect the phobic from an imagined or non existent threat. Under hypnosis we can remove that bad programming and replace it with positive programming, and this all happens whilst the subject is in a wonderful relaxed state.